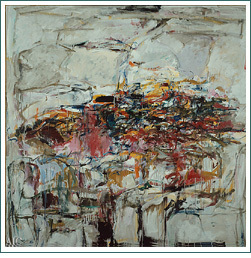 Joan Mitchell, City Landscape, 80 inches by 80 inches, 1956. After Clairan’s excellent post on Mary Abbott, I want to go back and review and add to what I know about Abstract Expressionism. And just to be perverse, I thought I would show only the art of women associated with that movement. Probably the most famous names among the Ab Ex’s are Jackson Pollock, Mark Rothko, and Willem de Kooning. 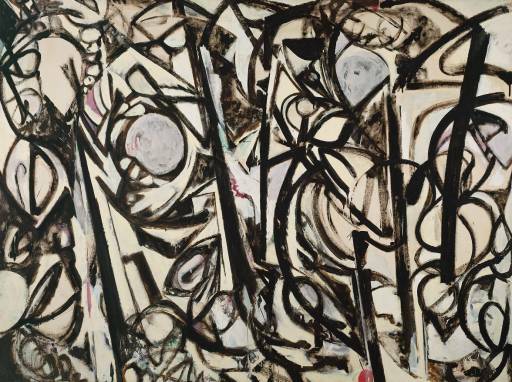 These painters, like the other abstract expressionists, are vastly different in their styles and conceptual ideas about their art. Pollock felt he was imbuing his work with personal and psychological action while Rothko desired to encompass a metaphysical vision of the universe. Others concerned themselves entirely with the pure materials of their art, the paint, the canvas, and the picture plane. ArtLex on Abstract Expressionism has a great set of thumbnails for an overview of the variety of kinds of work done within the movement. The Spaightwood Galleries had a 2006 show of Contemporary Women Artists that included many of the abstract expressionists. 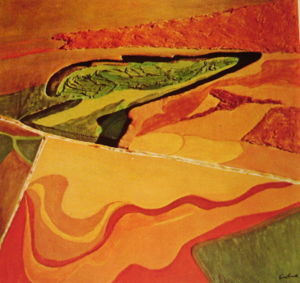 In general, the abstract expressionists showed a powerful use of the painting “material” and color. They usually worked big, with canvas that needed large walls (or in the case of Pollock, big floor space) to be worked. Ab Ex paintings are generally non-representational (although both de Koonings are exceptions) and address the whole canvas without working for a focal point — “overall painting” as some have called it. Wikipedia’s article on Abstract Expressionism lists 68 ab ex’s, with 9 of them being female. 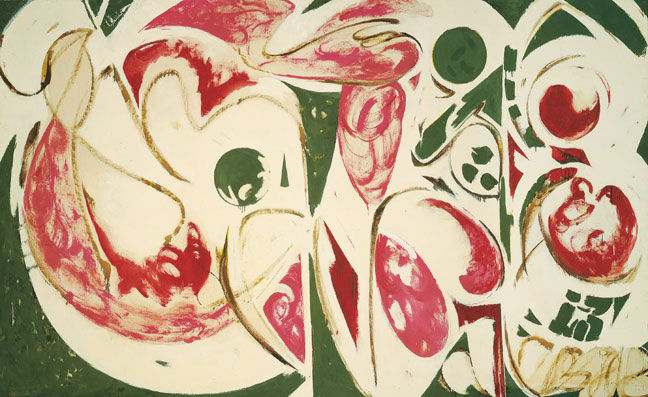 Besides Mitchell and de Kooning, these nine include Lee Krasner, Louise Bourgeois, Mary Callery, Jane Frank, Helen Frankenthaler, Elaine Hamilton, and Grace Hartigan. Clairan presented us with a 10th — Mary Abbott. And my research has found Sonja Sekula, Hedda Stern, Ida Kohlmeyer, Sari Dienes, and Ann Ryan. “This exhibition was interesting with respect to how Sterne, Krasner, et al. approached the dominant art discourse of the time, a “law” they themselves helped shape. Subsections of that code included a commitment to abstraction, gesturalism, and the notion that the artist must give in to the rhythm of the painting. Frankenthaler–represented here primarily by watery canvases from the ’70s whose nearly oxidizing surfaces, on which the occasional crusty splash or drop “crawls” like a crustacean, are surprisingly anticipatory of Sigmar Polke’s splashed “resin paintings”–developed the greatest loyalty to this law, particularly its criterion of originality, through her invention of the “soak/stain” technique. But more decisive for her reputation as the doyenne of Abstract Expressionism was the fact that male artists such as Morris Louis and Kenneth Noland-directed by Clement Greenberg-embraced her technique. 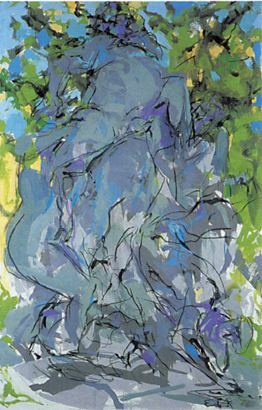 By contrast, Elaine de Kooning’s comparatively meager institutional recognition as an artist can be attributed to her conscious flouting of the AbEx framework. External factors like her marriage to Willem de Kooning and her role as an Art News critic exacerbated the lack of recognition as an artist, and her adherence to portraiture certainly entailed artistic isolation at that time. From today’s point of view, her series of sitting, faceless men seems particularly successful in that it shows the tension between recognition and misrecognition of those portrayed: The more she attempted to represent her male sitters, the more “empty” their faces became. For Willem de Kooning, though, portraits were nothing more than “pictures that girls made.” Bad conduct and equally harsh words were considered good form. 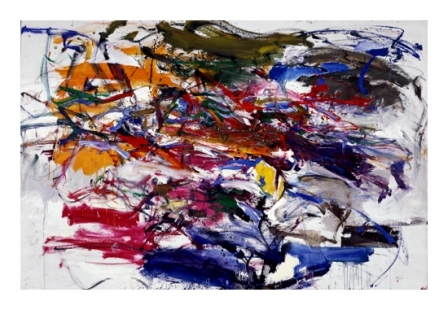 No wonder Joan Mitchell fled to France at the end of the ’50s, where, no longer subject to the constraints of the New York School milieu, she could develop her own self-confident, striding touch. “This is so good, you would not know it was painted by a woman.” Hans Hoffmann about his student Lee Krasner, 1937. And the obligatory question: When you think of abstract artists who are working in fiber, do you see any who seem to be influenced by or share an affinity with the women mentioned above? And of course, do you know any other names of women important in the abstract expressionist movement? I googled and found this intelligent discussion and thank you for it. I am giving a talk next week on Women Artists in the AbEx movement and I loved reading the first hand experiences here! Wow, what serendipity to find such an interesting blog! I just realized that April has 5 Sundays and I only have 4 Sunday Contributors. So I’ve covered myself, however badly. June found that my link didn’t work for her so replaced it with what turned out to be a link to something different. We’ve been testing out a couple things. My Google search was on “abstract expressionist women” and the Leja book was on the first page of results. I think Google is pretty smart and noticed that I went back to the same place a few times this afternoon. Now I try the same search and and cannot get there. Hmmm. Fortunately I bookmarked page 256 of Leja’s book. Decided it was time to see what tinyurl is all about. It’s really easy. > page that was located in the original google search. > you’d get the next few pages. I’ve not tried it. Good luck if you try the link. I’m going to try and get the book through the library. I hardly feel qualified to add anything here beyond my own first person experience. Like Susie Monday, I was there when it was all going on. I grew up a short train ride to Manhattan and lived in a public school district that took full advantage of all that cultural wonder so close to home. We knew the guards at MOMA by their first names. In the early 60’s I convinced my parents that I was responsible enough to go into the city alone and spent many Saturday afternoons going from one gallery to the next with NY Times and the East Village Other as my guidebook. I was stunned and amazed by the audacity and energy of the AbEx artists who were everywhere clamoring for attention. across a stark white canvas as if a fencer had been working with a foot thick mop! It was astounding – and she was a great shrew the way she yelled at the helpers. Without any thought at all I would admit that my major art influences have all been AbEx. I haven’t seen this in the quilt art with which I’m familiar. Could you name and link to a couple that you think are working in the ab ex style? The only person I myself know of is Ann Johnston. Her website doesn’t show the ab ex styles as clearly as I would like, but underlying some of her dyed and stitched fabric is a strong similar vision. 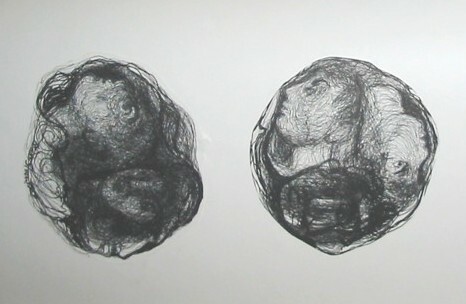 By the way, I have a blog entry on Art and Perception today about the Ab Exs — different images and different text, but same subject. It’s more about the style than the artists involved. Hello everyone – I joined this group about a year ago fully intending to learn by participating in the discussions. I’ve been impressed with the quality and a bit overwhelmed by the quantity of material presented. Coming out of lurkdom for a moment even though I’m not really ready (and wondering if I’ll ever be). I googled abstract expressionist women and was taken to page 256 of the Leja book. The chapter is ‘Narcissus and Chaos: Subjectivity, Ideology, Modern Man and Woman’. Page 257 includes the ‘famous’ 1951 photo Irascible Group of Advanced Artists. Hedda Sterne is the only woman. I’ve not read this carefully yet but what I’ve read is very interesting and speaks of the focus of the times on the Modern Man and the exclusion of women in general. The Gibson book is available on Amazon. Growing up as a young painter in the shadow of the ABEX crowd, even moving to NYC with my then-husband, also a recent art graduate, I still love and devour these paintings. Even with my own bias toward narrative in my own work, I was awed by the work I saw in the “big name” galleries of that time. Even though many other stands were raveling and unraveling at the time (Warhol, conceptual work, post expressionisn) somehow my aesthetic roots lie in these paintings, that first came to my attention when I was about 12 (1960). I think what has always impressed me is the presence of many of thes paintings. 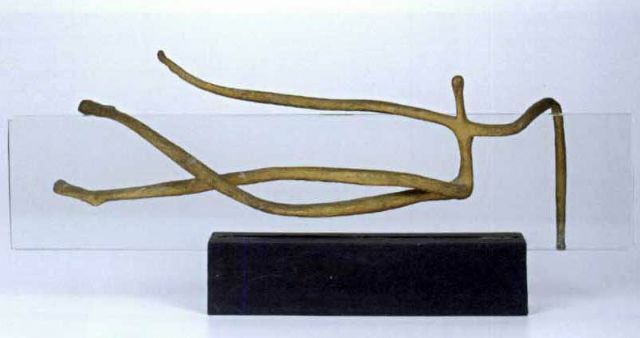 They seem to exist in a realm of “monumental object” that few works of art achieve. 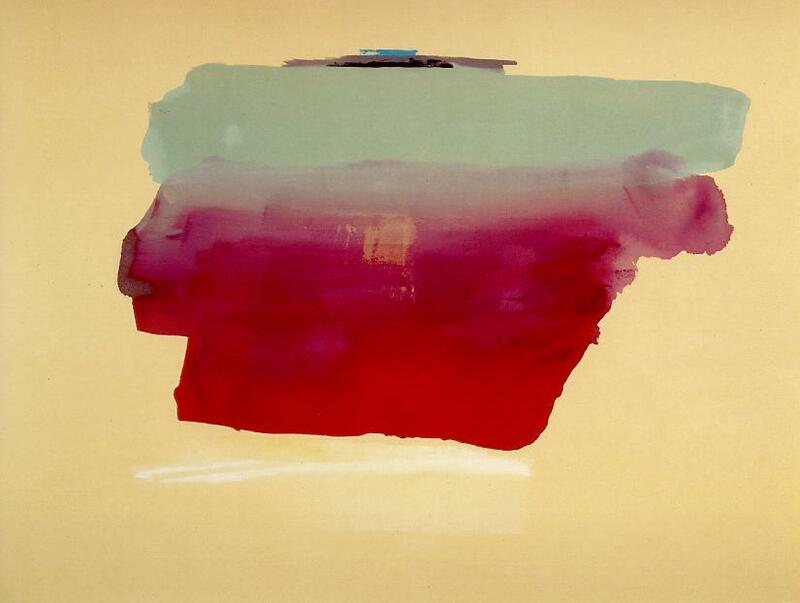 I saw a one-woman show of Frankenthalers that I will never forget. it was like walking into a room of waterfalls, but silent ones. 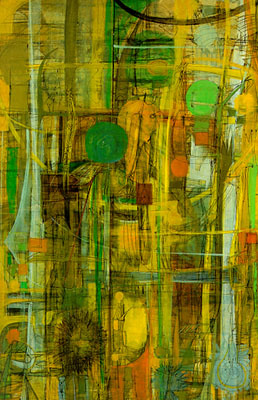 The physical size of the canvases were just one aspect, somehown the work had a scale that felt like a force of nature. And, unfortunately gender bias was still a serious factor, even as the women’s movement started giving us ways to question the status quo. Thanks for introducing me to some new names, June. I especially love the photo you posted of The Sun Room. I think that there were a ton of painters in the ab ex style and period who happened to be female, and that they were accepted, albeit somewhat patronizingly, by their male counterparts. The whole thrust (pun intended) of the 1950’s, however, demanded that spokespeople, prominently protruded figureheads, and Leaders of the Pack be male. It was a society that for a variety of social, political and cultural reasons was determined that women would return to their pre-1880 status. And for about ten years the society sort of acquiesced. But that’s a different matter than the actual facts on the ground, which is that women were painting up a storm and engaging in the activities, the thinking, drinking, talking, studying, starting up schools, abandoning schools, quarreling with other artists, and so forth that men were. They were also making art that often equals what we are told is the highest achievement of the males. Haber sites the book (which Olga speaks of in her comment on Clairan’s post)_ “Three Artists (three women): Modernism and the Art of Hesse, Krasner, and O’keeffe,” by Anne Milleton Wagner and suggests that the fault was not in the style but in the full milieu. The women are always photographed in the men’s studios, the men never in the women’s, but that could be a bias on the part of the photographer, or even the media that chooses which photos to publish. In other words, I’m making a distinction between what the official reports of the period have laid on the movement and what actually was the case. Now for the disclaimer: I haven’t read Leja and Haber is very positive about his ideas, even while gently seeming to take issue with them. I’d have to read the Leja (which I agree — we need a copy of it) as well as the Gibson, and then think through the issues for myself. In part the incredible liveliness and rebellion and excitement and newness of the ab ex work meant it was more open to women than one might have expected, given the milieu. Or maybe I just love Frankenthaler and Mitchell and Krasner and some of E. deKooning and so forth. Oh goddie goodie goodie June! I could only look at the pictures tonight — but I will tell you that I added Mary Abbott to the Wikepedia article on Ab. Ex.